When the development of the Century City complex began in 1996 the 200 hectare piece of ground consisted mainly of bush with the main invasive alien being the Port Jackson Acacia. It's a tree that grows very quickly and flowers in the early Spring. For hayfever sufferers it is a menace. Also on the site was a degraded wetland which was utilised by water birds for breeding. 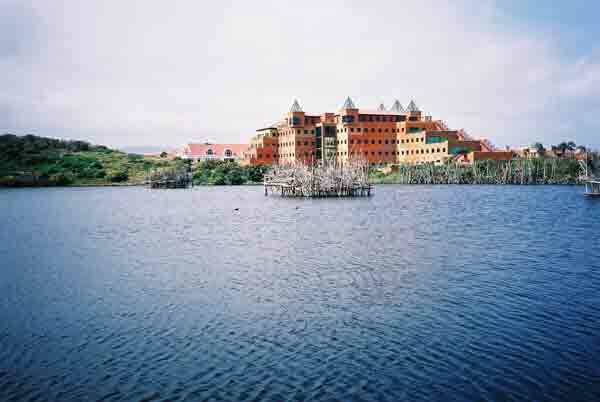 When Century City was being planned it was decided to develop the site in such a manner that there would be a succesful wedding between property development and conservation. It was then that Intaka Island came into being. The aim of the development was to: conserve rare and threatened vegetation, to preserve a rare type of wetland habitat, to provide a habitat for birds especially breeding water birds. 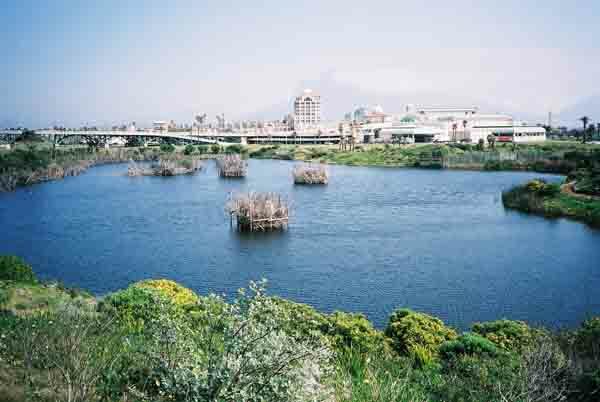 As Century City was going to be built between a network of canals the Intaka Island complex also provided a means of cleansing the water in the canals naturally. The final aim of the island was to provide a recreational and educational amenity for people living and visiting Cape Town. Today we have just that. Intaka Island is completely surrounded by canals which provide a natural barrier between the built up areas and the natural environment found on the 16 hectare site. What is really interesting is that the site is divided into two sections, east and west. The 8 hectares which make up the western section of the island were built from scratch. In this area there are four ponds through which the canal water is circulated and purified naturally. In the ponds various water fowl live and breed. Pond 3 is the largest of the ponds and has an artificial heronry built in it. This has been done to encourage the wild birds to build nests and breed in the area. The eastern half of the Island consists of 8 hectares of seasonal salt pans and sand plain Fynbos.These pans are known as Blouvlei. 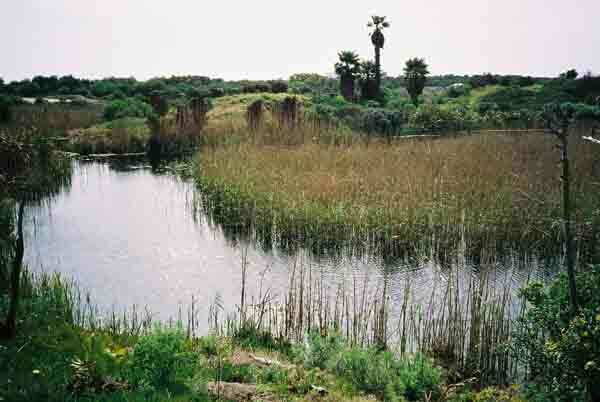 (Blue Wetlands) In this area some of the Fynbos which used to grow on the Cape Flats and which has been destroyed by urbanisation of the area are now protected. With all this water about there must be some birdlife about. In fact there are 120 birds species using the Island although only 70 are seen regularly. One of the tortoises I saw on the island. 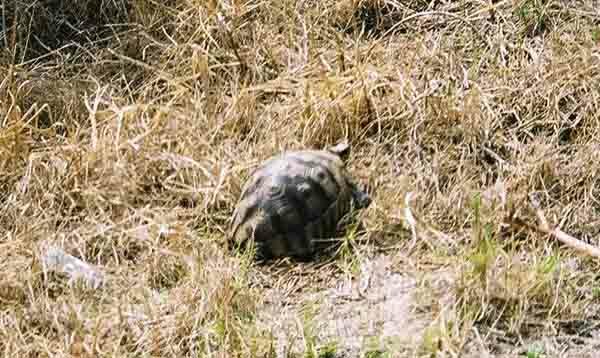 In my walk through the park I came across a number of tortoises and I am told that there are a number of other mammals, reptiles and amphibians on site as well. The whole island complex has 177 different species of plant life many of which were in flower when I visited. Of course with so much water about there must be some fish about as well. I was informed that there were two species of fish to be found in the canals. What is really good is that there are two ways to get to the island. The first is by boat which you can hire at the Canal Walk complex or by car where you can drive through the Intaka complex to a bridge which crosses over the canal. There are laid out pathways on the island which allow to explore the various ponds and to visit the bird hide which has been built on Pond 3. In order to keep the whole area healthy and to conserve water it was necessary to develop a natural water purification system. In South Africa water is a scarce commodity so the conservation thereof is a necessity. The usage of water out of the dams supplying water to Cape Town was not an option when the planning of the canal system took place. The water in the canals had to be obtained elsewhere and had to be kept clean to maintain the upmarket character of the Century City development. The following system was devised. Partially clean water is pumped to the complex from Potsdam sewage works about 15 kilometres away. When it arrives at the island it is pumped through a sprinkler system which aerates the water and spreads it across the first pond. At the far end of the first pond is a weir where the water flows into the second pond. Both ponds are about a half a metre deep and are planted with reeds which are fast growing. Their job is to absorb most of the nutrients (especially phosphates) which are pumped in to the ponds in the water from the sewerage works. Pond three with some of the heronries built in the middle of the pond. Pond number three is large open tract of water and is about 2 metres deep. The flow of water through this pond is slow and this allows the nitrates in the water to sink to the bottom where they are filtered out by the bacteria in the mud. Pond four is a very shallow and vegetated. Looking at it you would think that it was a lawn that has been flooded by a river. It is very popular with small birds who use it as their bird bath. It is here that the last aeration of the water takes place before it is pumped into the canals which are a feature of the Century City Development. Some people might be sceptical and ask how a couple of ponds can clean water. Well take it from me, the system works, there is no smell, the water is clean and the bird life in the area appears to be extremely healthy. Take a peek at some of the photos. Does the water look sick to you? To me its amazing what a bit of planning and the utilisation of nature can do. 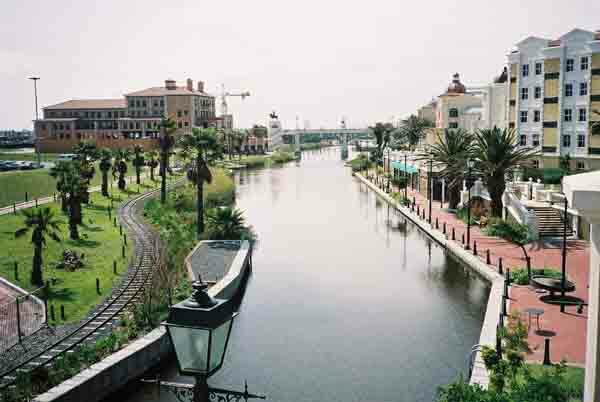 When you are in Cape Town why not visit Canal Walk and Intaka Island and see for yourself.